There is a monster in this house. It is my utility closet, burping up fleeces. 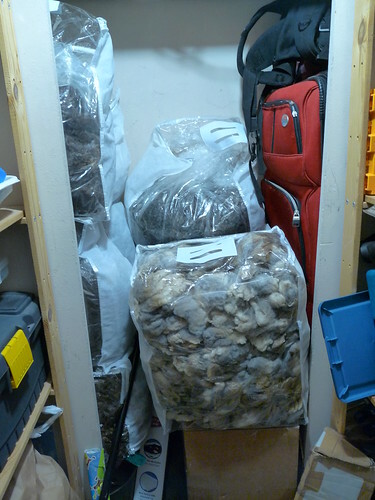 It started out innocently, washed bags of lovely wool stacked in the back of the closet... there was space, and the fleeces filled it happily. 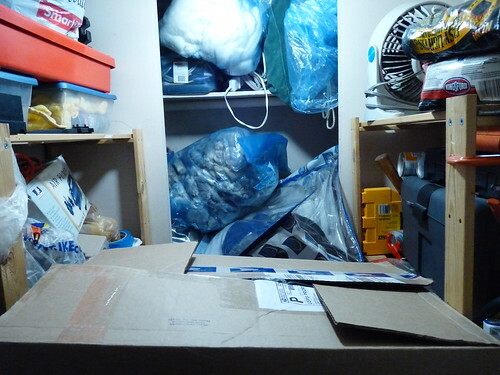 Soon they started spilling out of their little corner and onto the floor of the closet between the shelving-- in boxes waiting to be washed, in oversized Ziploc XL and comforter bags, in shipping containers. It got to be where I was just stacking boxes on boxes, where I would forgo grabbing the toolkit or other non-fleece things that were TIC with the fleeces because it was too much of a hassle to reach them. I know a lot of the problem was the boxes-- I have been storing unwashed fleeces and pindraft rovings in the cardboard homes they were shipped to me in, but still. So last nite, armed with an empty house and a bunch of new zippered storage bags from Cleaner's Supply, I went to town and repacked everything. Meanwhile back on the farm... 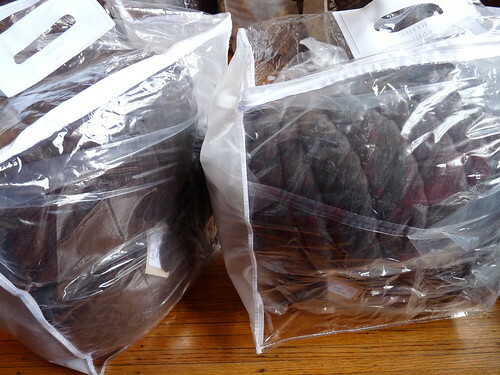 I repacked all of the washed locks I had in the blue Ziploc XL bags too. The Ziplocs were great but too big and awkward, and these are perfect for being able to easily see the naturally colored rainbow at a glance. Velveeta! 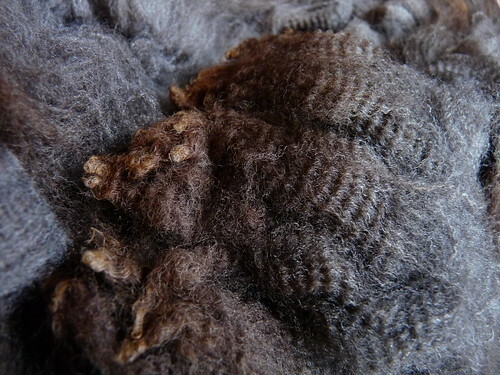 :) Another lamb's fleece from Whitefish Bay Farm. Off to go admire my empty closet... 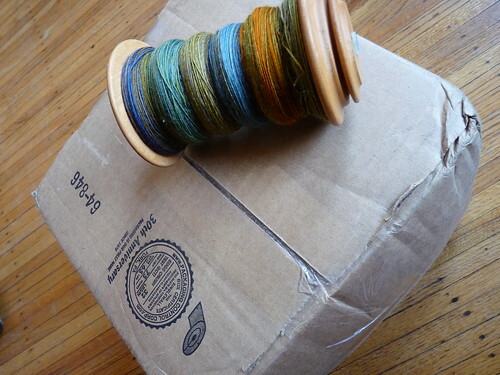 I'll pull a winner for the merino/silk Verb for Keeping Warm spinning fiber contest next Monday (5/4) since the project is done and should arrive by its destination by then (don't want to ruin the surprise :)) Miss you, til then! 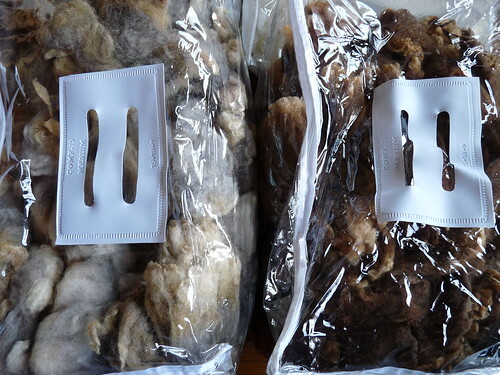 The fleece looks so pretty in those bags! I just have one, and half of it's washed. I have them in muslin bags, so I have to do a sniff test to find out which bag is the clean one! Mine are in Rubbermaid bins, lots of Rubbermaid bins. 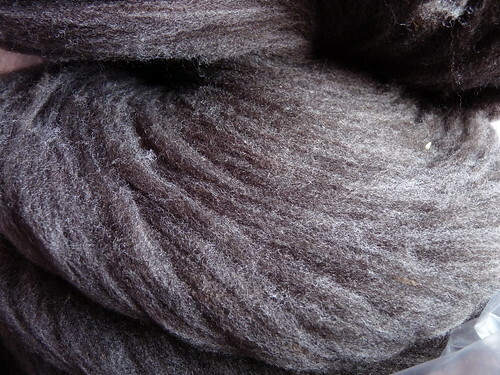 And most are natural colored fleece. And, I'm about to move the stuff yet again. I've got four fleeces still to be washed from two years ago. I hope that I can one day go through and organize the lot of it. I do think I'll order some of those bags because they look handy. Thanks! 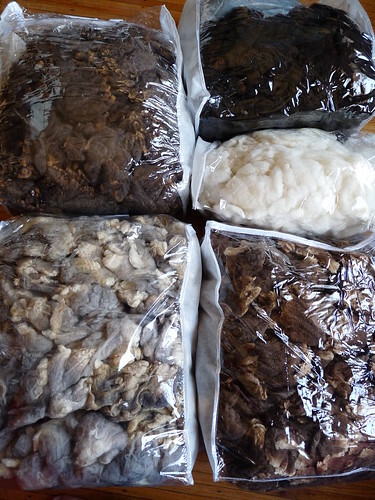 Wow that's a lot of fleece. I have five pounds of llama (sent out for processing) in three wonderful colors and seeing all your fleece just makes me want to spin it so bad....but there's just not time for it right now. your first photo ... yikes. Made me "itch" just to look at it. But your after photos .... why is it that neatness makes us feel SO much better LOL? I had saved "new comforter" bags and had something similar to other linens in, but have bookmarked the bag page in case I ever need more. I also use some of those monster XXXL ziploc bags -- they can also hold a comforter! And the fair isle book ... oh, be still my heart re the prices on Amazon, sigh -- too much. Ha! Your fleece closet looks just like my yarn/fiber closet which was supposed to be the coat closet. Now I have fleeces stacked in plastic bins in the guest room and up under the big work table in my wee spinning area. This makes me feel like I'm not as crazy as I think I am. And I LOVE the blanket bags - thanks for the tip, I'm gonna get me some! And I have Aran Knitting, but I'm afraid it will have to pried from my cold, dead hands, even though I'd kill for a copy of Poetry In Stitches.